Shenandoah (Anthony Steffen) works his way into a band of highwaymen led by Lupe Rojo (Armando Calvo). His initiation consists of hunting down and killing a member of the gang who has 12 bullets while he is given only 2 bullets. 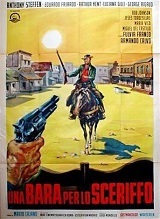 When the bandits attempt to rob a wealthy rancher who Shenandoah knows, Shenandoah warns the rancher. The outlaws begin to suspect they were betrayed and commence to rough Shenandoah up. Shenandoah then reveals his true reason for joining the gang; one of them killed his wife and he is there for retribution. Also stars Eduardo Fajardo, Fulvia Franco and George Rigaud. Comes from a very nice uncut widescreen import print.